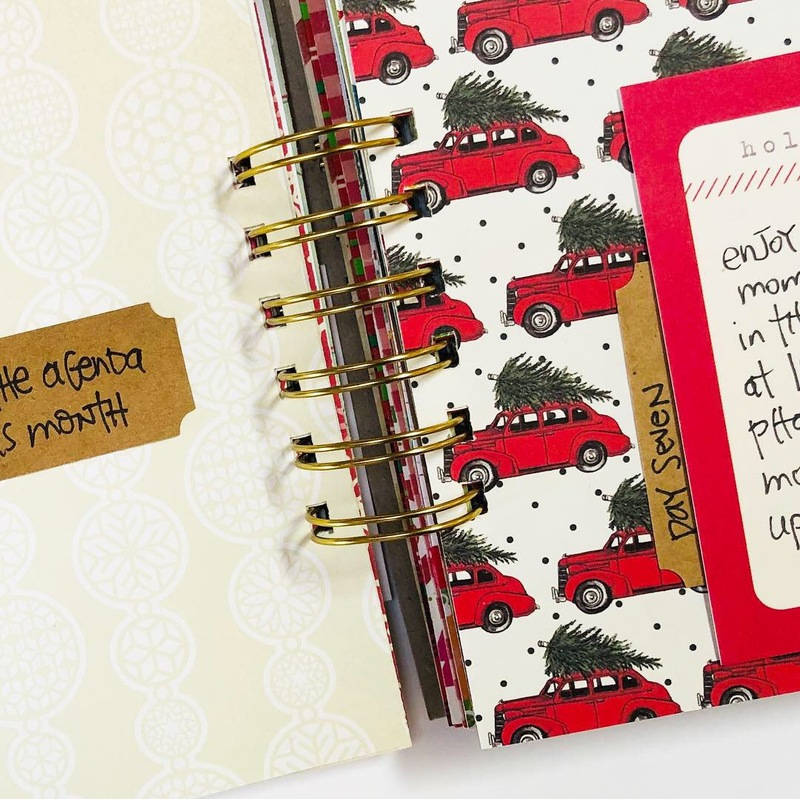 Who doesn't love a new project in a new notebook as the new year begins? 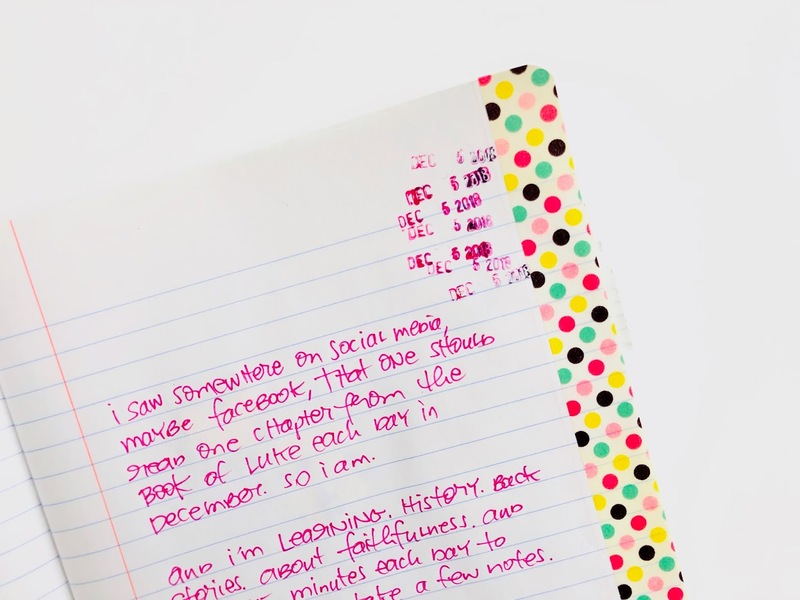 I admit, I'm a sucker for documenting our story and travelers notebooks are an almost effortless way to get it done. 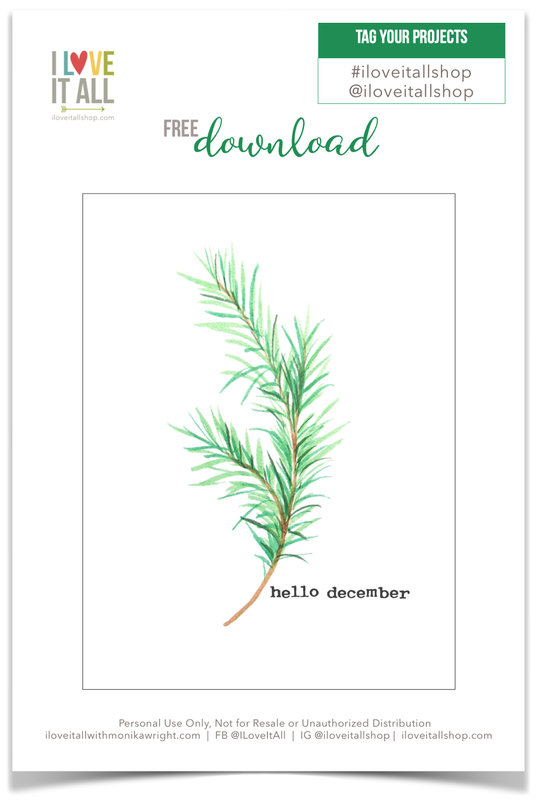 I used the free “hello january” download to write the new year, and myself, a note. Sort of a pep talk, really. I’m not one to make resolutions, because I don’t want to be a failure by not following through. I do have good intentions, so that will have to suffice. 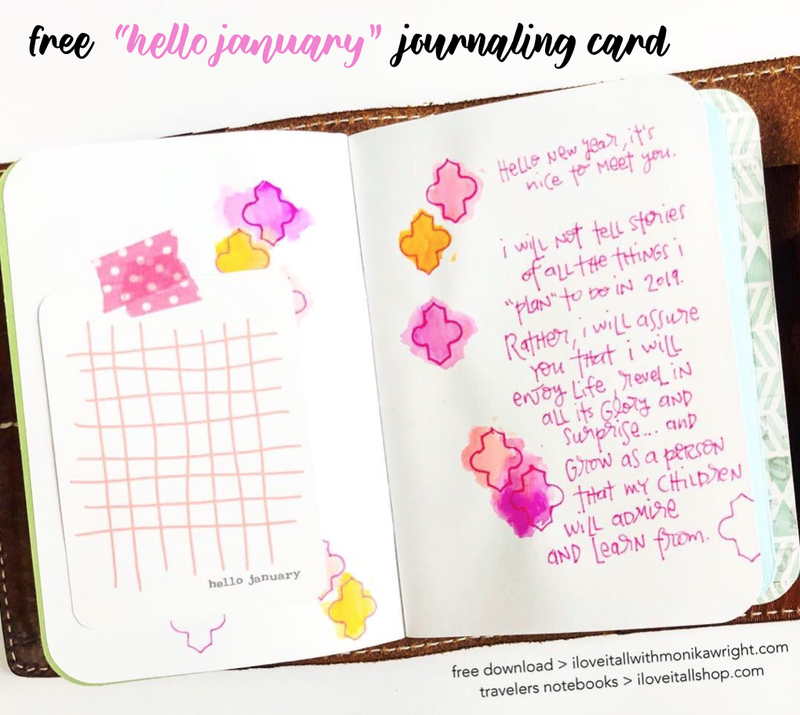 As a background, I used my watercolors and stencils and then outlined the stencils shape before adding my "hello january" journal card with washi tape. I used the right side for my pep talk. 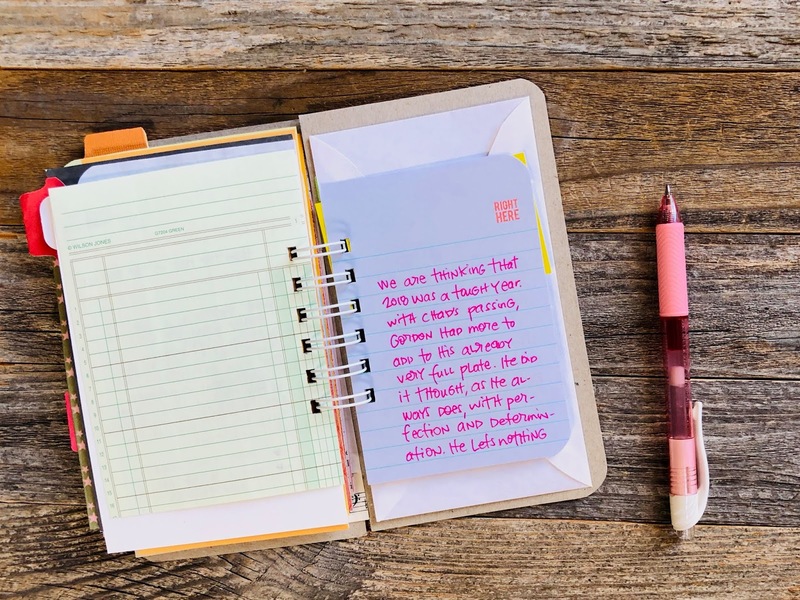 I'll be using this notebook set all year as I give each month ahead, and myself, an update and a little pep talk for the month ahead and I invite you to do the same. 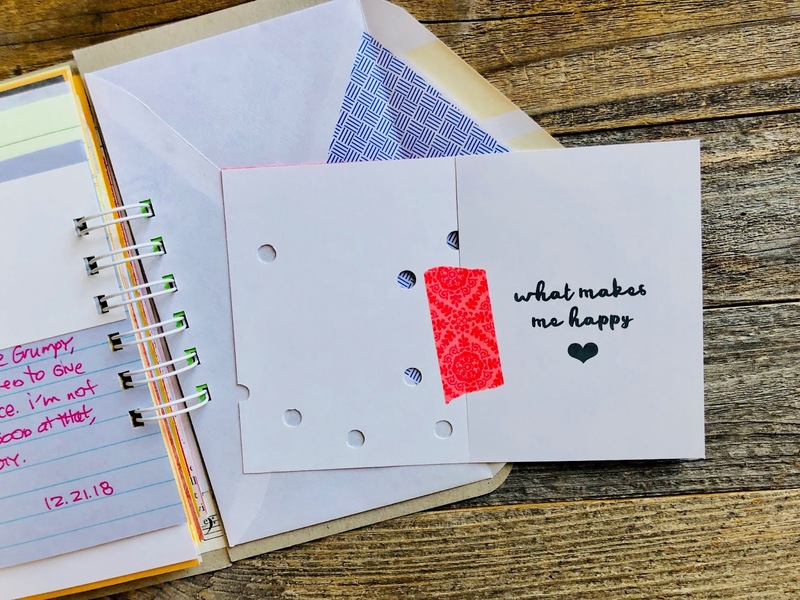 along with the journaling cards I'll be sharing each month if you're so inclined to join me in documenting your monthly mindset. 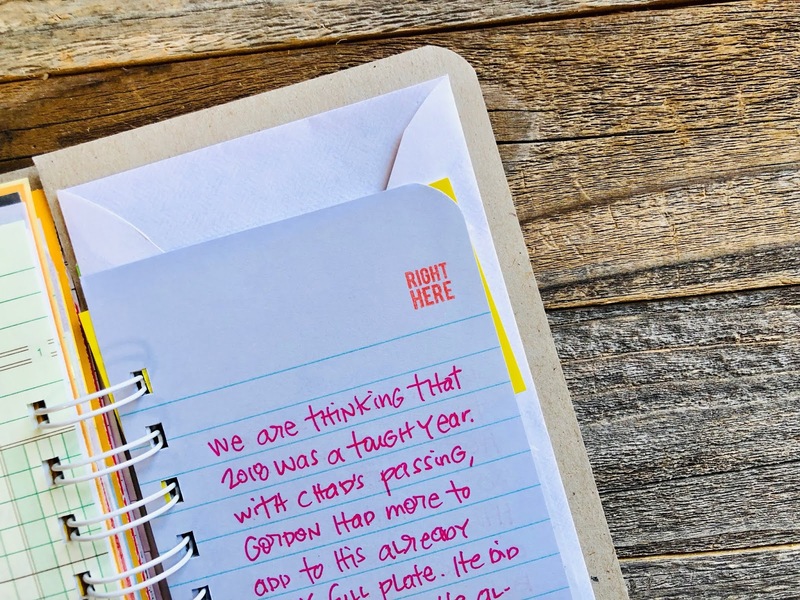 And somehow while I was journaling my note to self, without me realizing it my 2019 word of the year made an appearance. 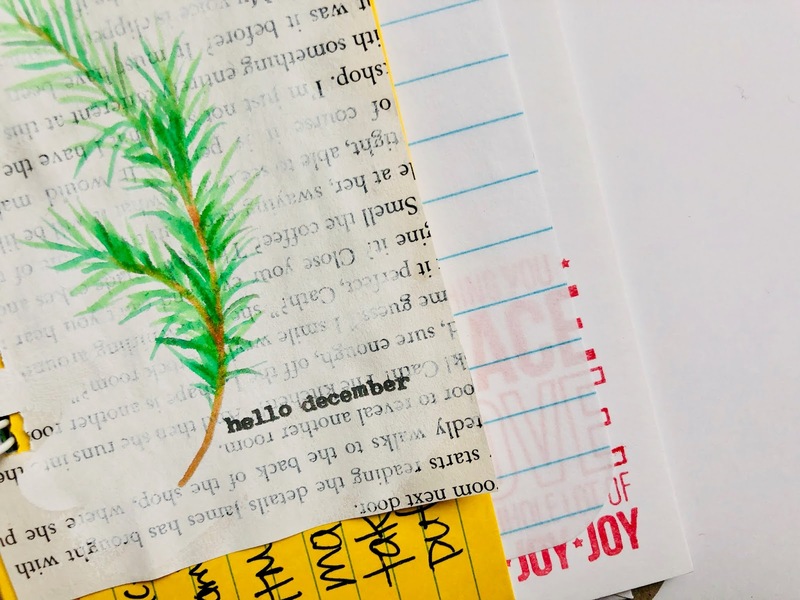 I'll be documenting GROW all year in Ali Edwards' One Little Word class. I’ll be using #hello2019_iloveitall on Instagram if you want to follow along over there. I'll be using my A6 travelers notebook from Chic Sparrow and a set of journals from the shop. 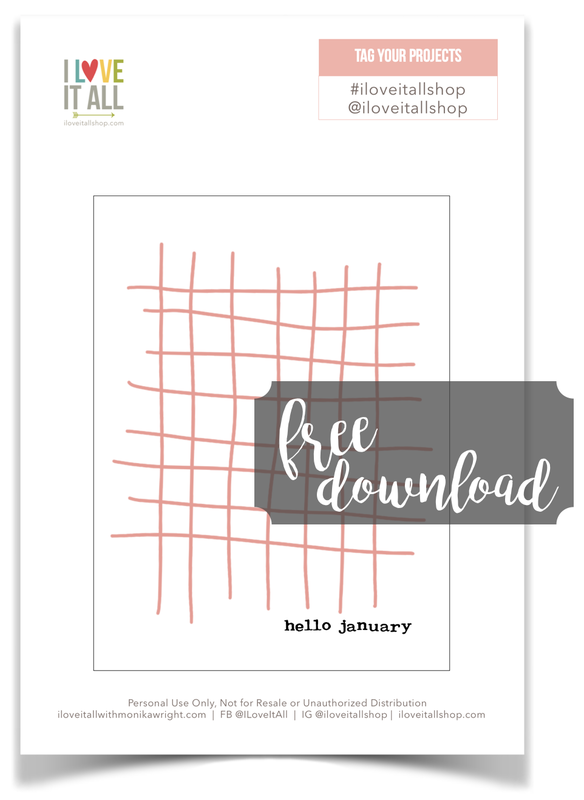 Download your free Hello January journaling card here. "Yes! Those few moments that we actually stop and listen to what's on our mind and in our heart. Golden!" True, right? In our fast-paced world, made more chaotic sometimes by our own lists and to do's and think we should's, those few moments I take to actually sit down, ponder and then journal do so much for my outlook on the day, on my life and sometimes I even cry a little because I'm so overcome by this life I'm so lucky to have. Pure gold for sure. To be aware of the little things brings me joy. When I review journals fro years gone by, my joy is doubled. 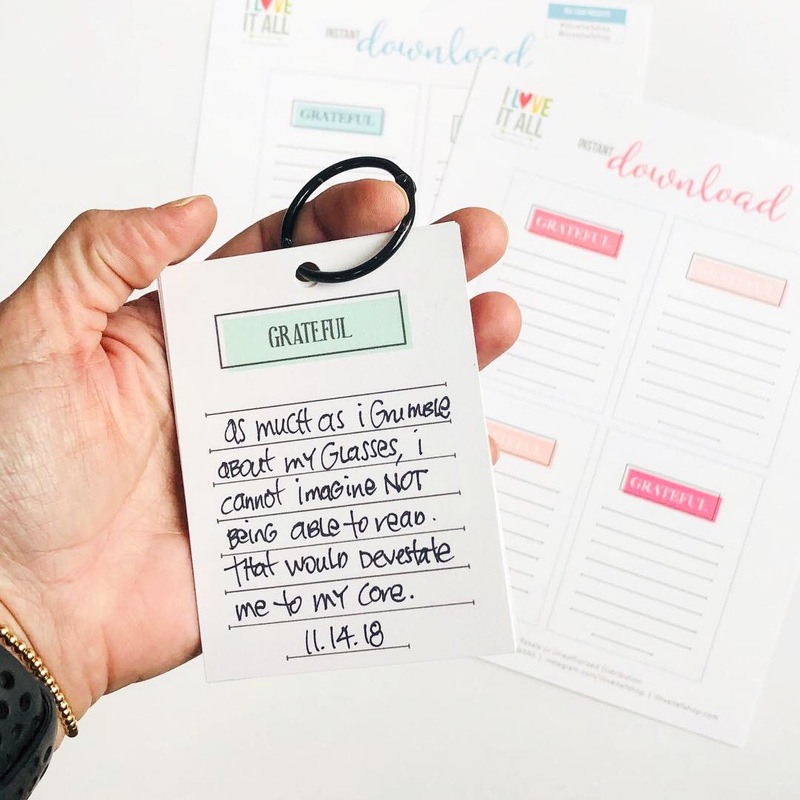 WONDERING IF GRATITUDE JOURNALING IS FOR YOU? If you've seen some of my journaling over the years, you'll see that my journaling style is anywhere from straightforward - using only my words and maybe a colored marker - to a more artsy, elaborate style - ranging from using modeling paste, watercolors, stencils, journal cards, washi tape and tags, much like art journaling. Yeah, that's a whole lot of journals. But, I use each and every one of them. Not all the time and not every week, but through the year, you'll see me sharing pages from each of them. The one in the upper right hand corner is the journal that started it all. I made it for myself and followers saw it and began requesting one for themselves. Lucky me! 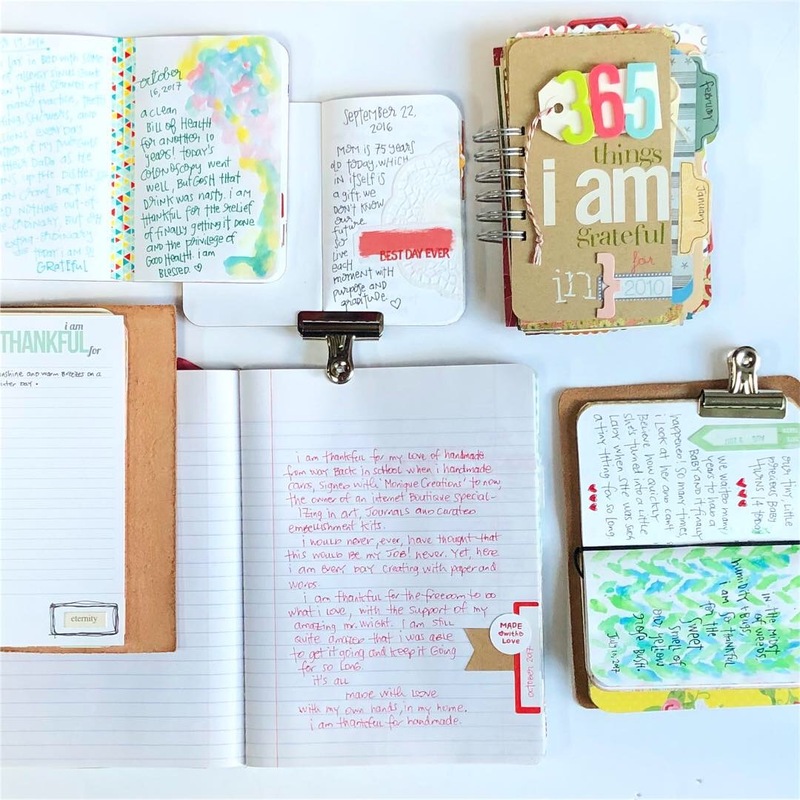 WHICH JOURNAL SHOULD YOU CHOOSE? 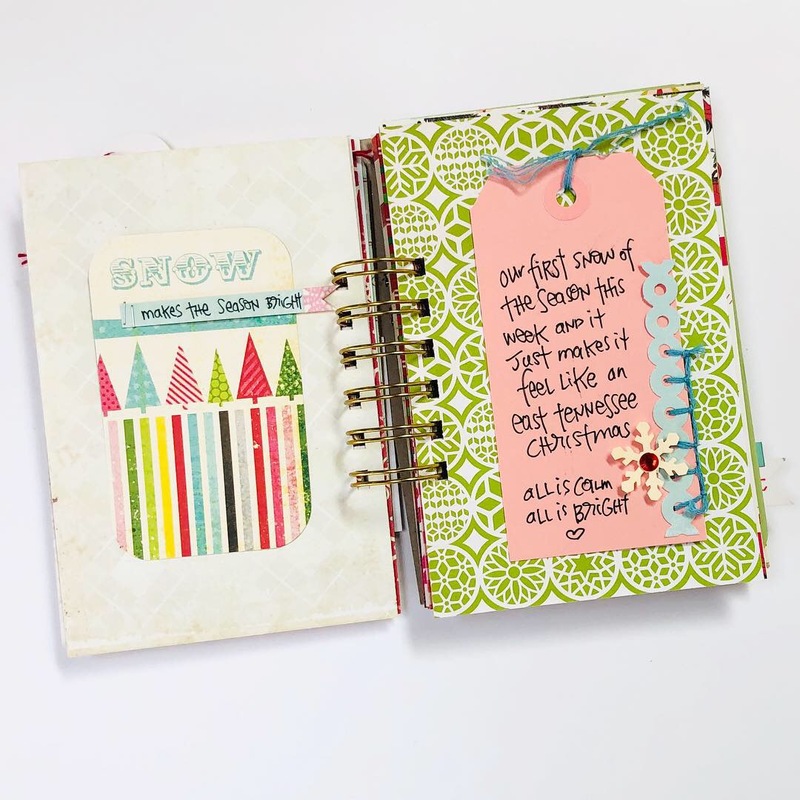 This lined pages spiral bound journal you see below is a great way to begin, comes with a mini embellishment kit. 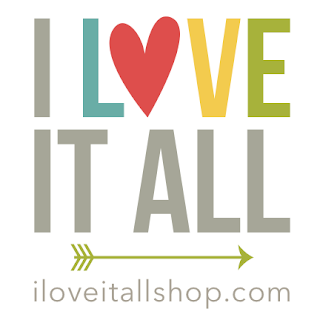 It is a ready to ship item and generally ships the same day! 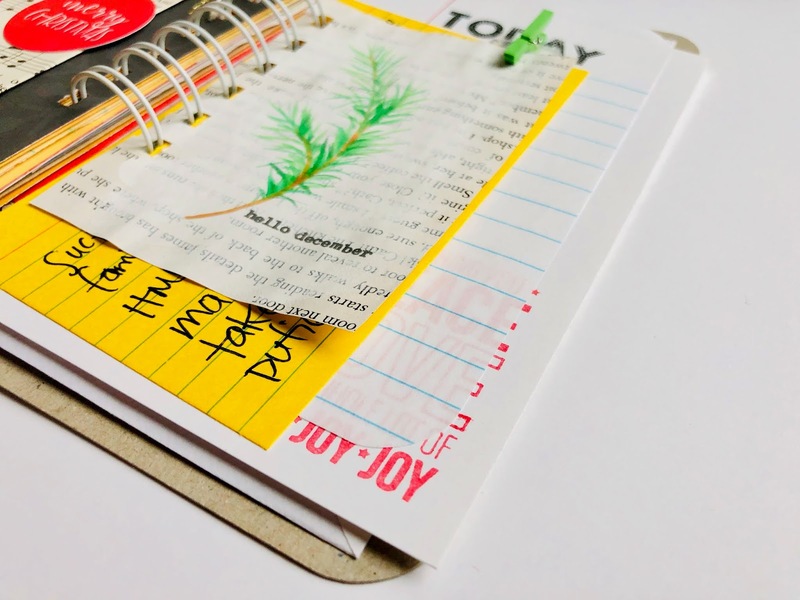 Don't let what someone else is doing stop you from journaling your thankful thoughts and grateful moments. Be you, be unique. Feel free to find inspiration to figure out what your style is, but don't be limited by what you see or intimidated that what you see is not anwhere near to what you had in mind. 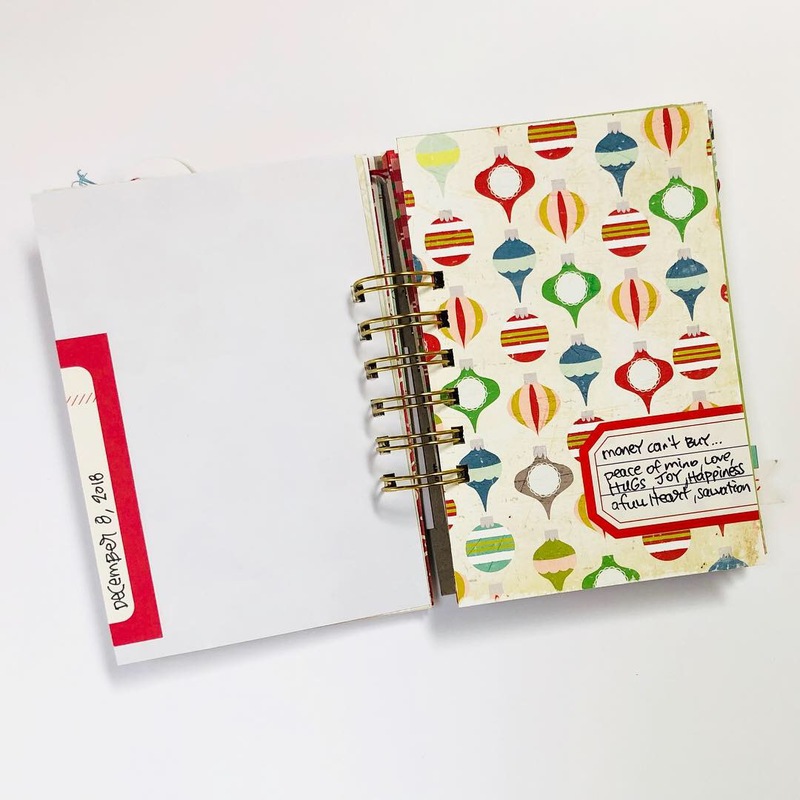 With this travelers notebook style journal, you get to choose how to journal - all the pages come to you blank just waiting for your words, thoughts and moments that make your heart grateful. 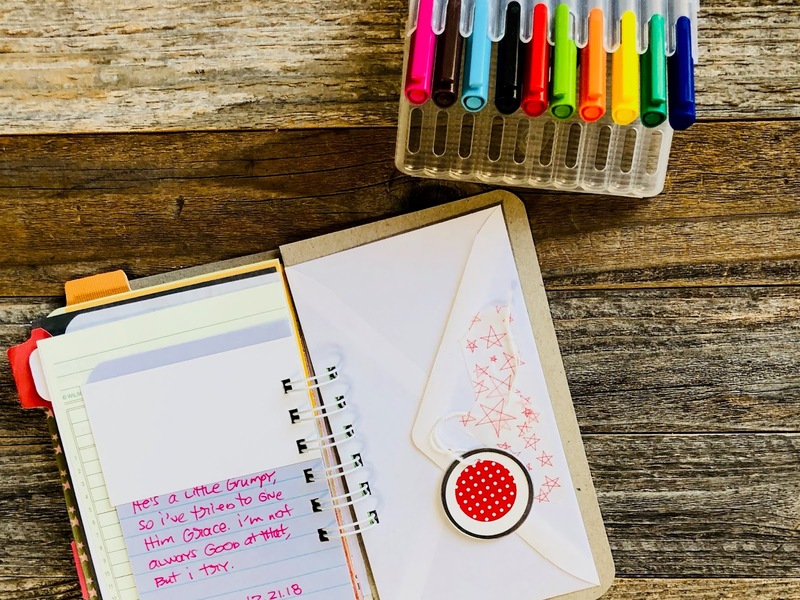 Are you a planner nerd? 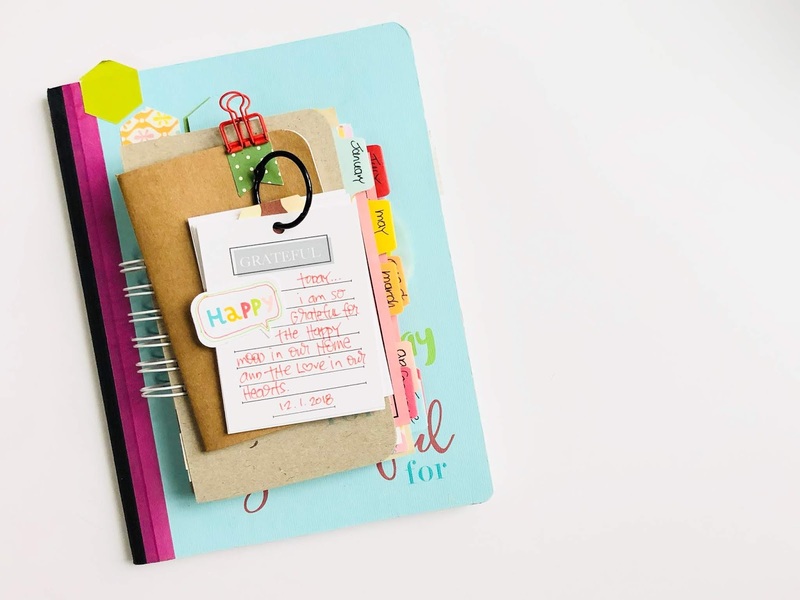 I've added these pages to my Filofax planner and use the off and on. They are available in both a color digital download and black and white digital download. The beauty of digital downloads is that you pay once and are able to download as many times as you need. 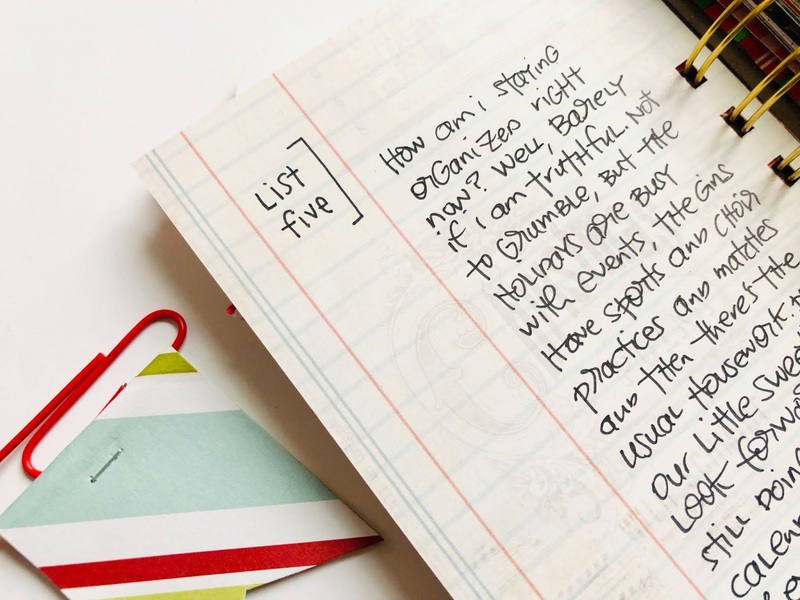 When I have a story to share, I turn to my composition journal. 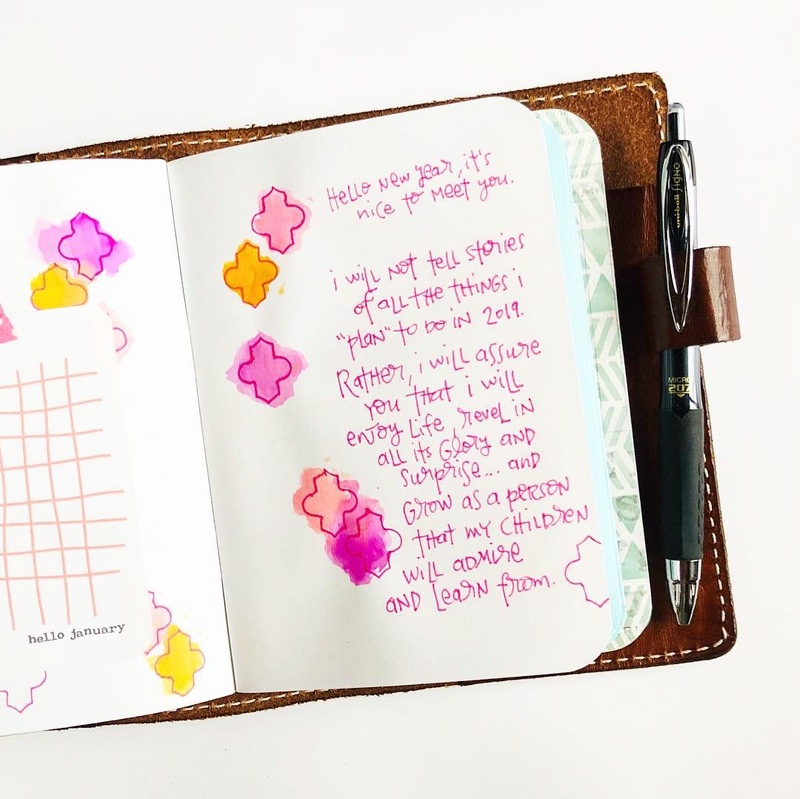 Last year, I went through my journal and embellished quite a few pages but left many of them blank. 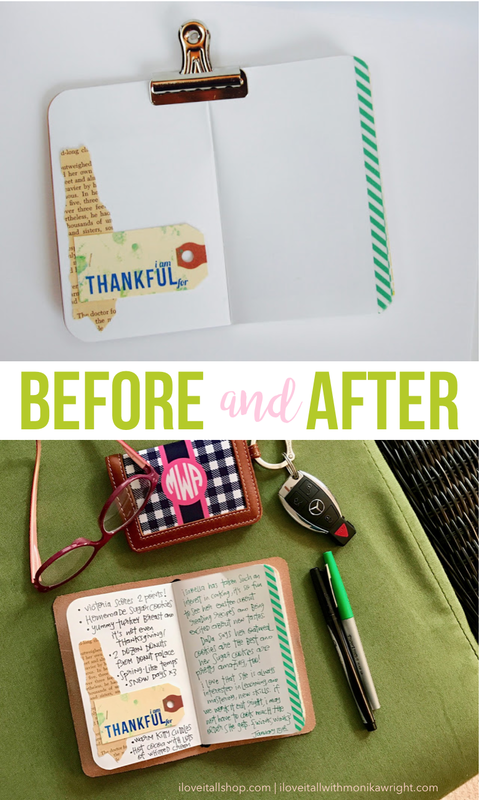 I happen to be a gal who likes to decorate and embellish her Gratitude Journal. 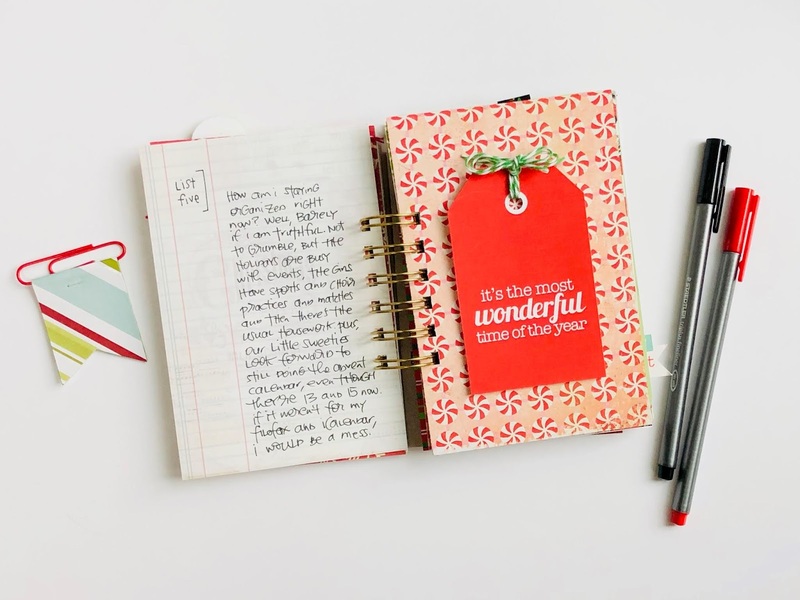 But, if you are not one of "those people" this journal is still for you. 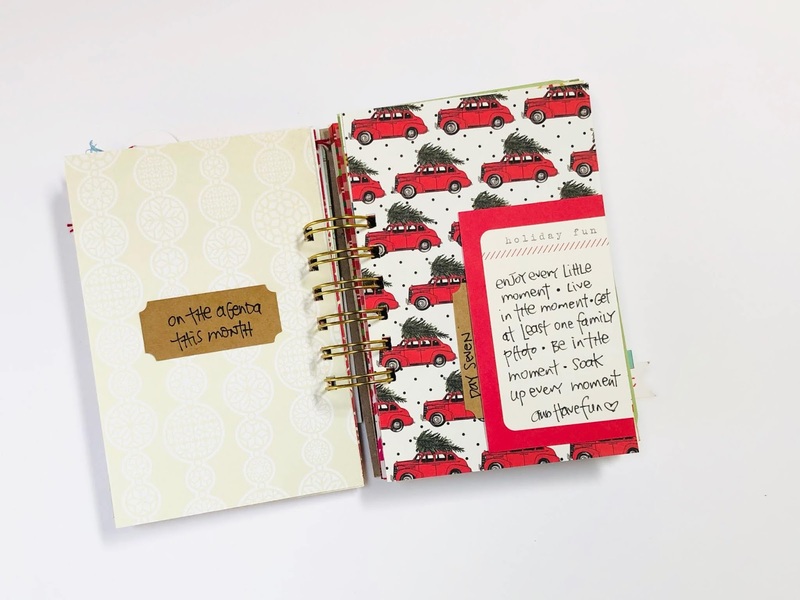 With 100 lined pages, you will be sure to have plenty of room to journal your story, maybe even for several years. 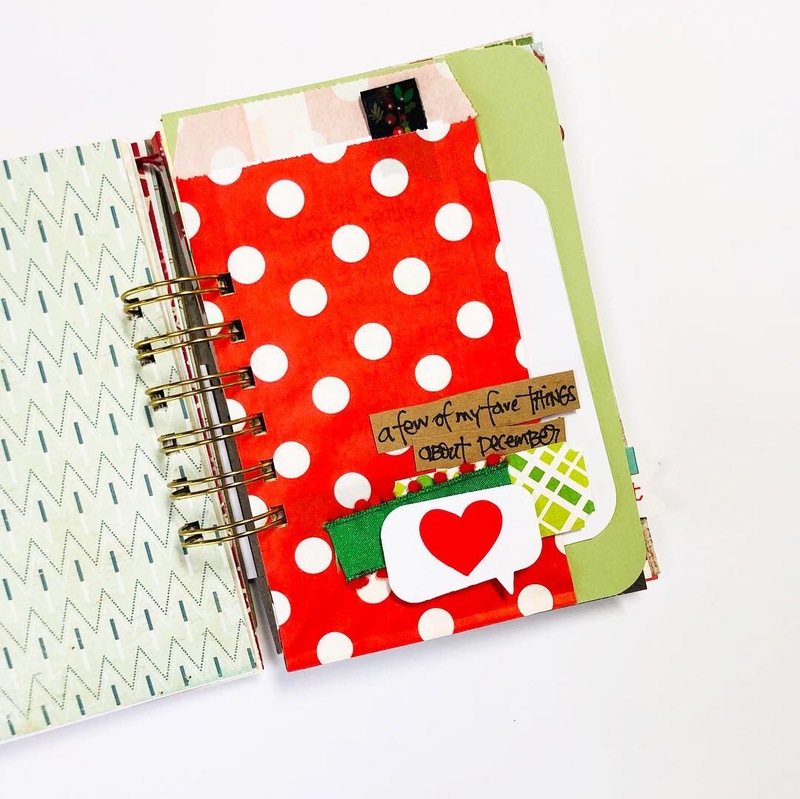 For today's #ilovethursday thanks, in addition to sharing this week's grateful moments, I also wanted to share a few pages I've prepped for the remaining pages left in this year's junk journal style Gratitude Journal. 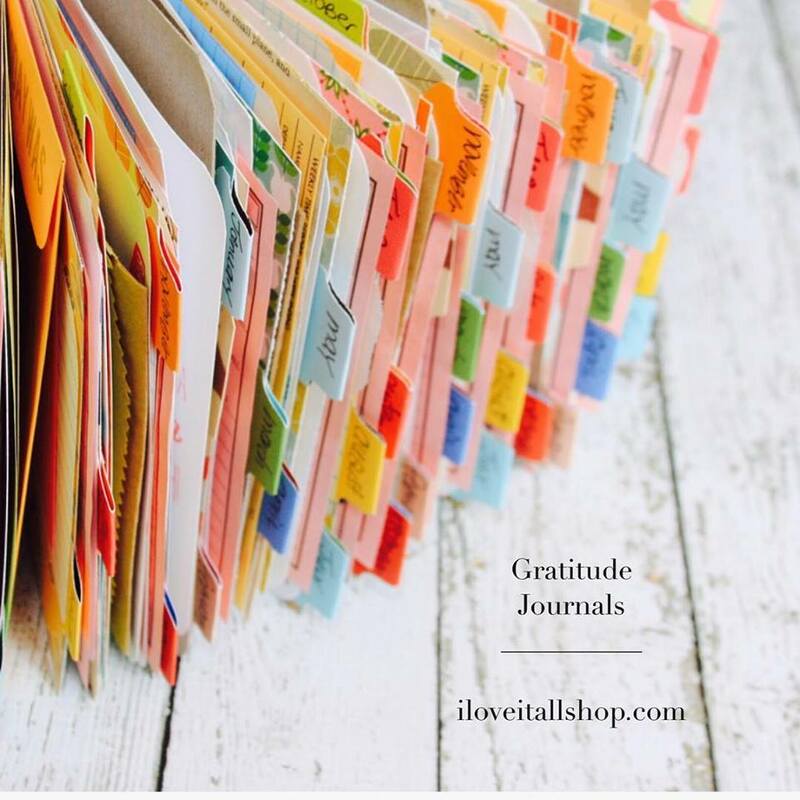 You can find the 2019 Gratitude Journals here. This week I journaled in my mixed paper journal...the Right Here stamp was already on the page and I kept it pretty simple with just words. 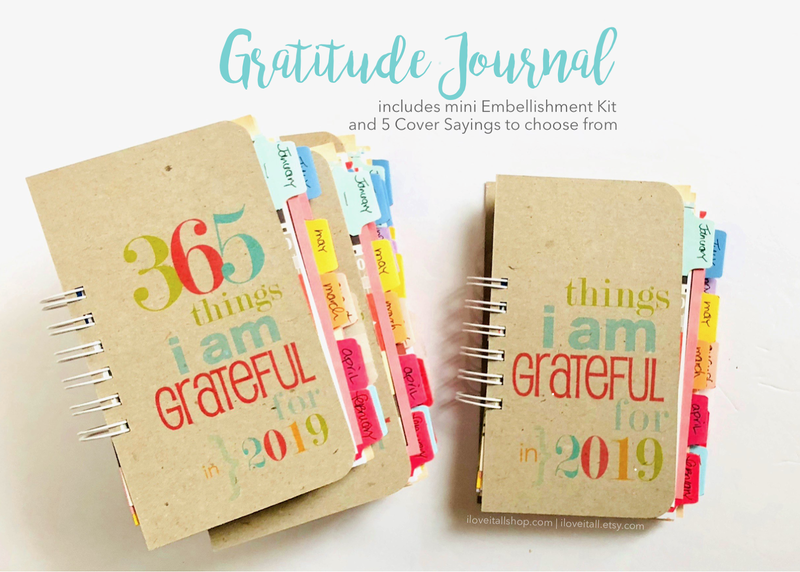 You can view more detailed photos of what's inside the 2019 Gratitude Journal, much like the 2018 journal I am using here, in this blog post. Or you can buy it here. 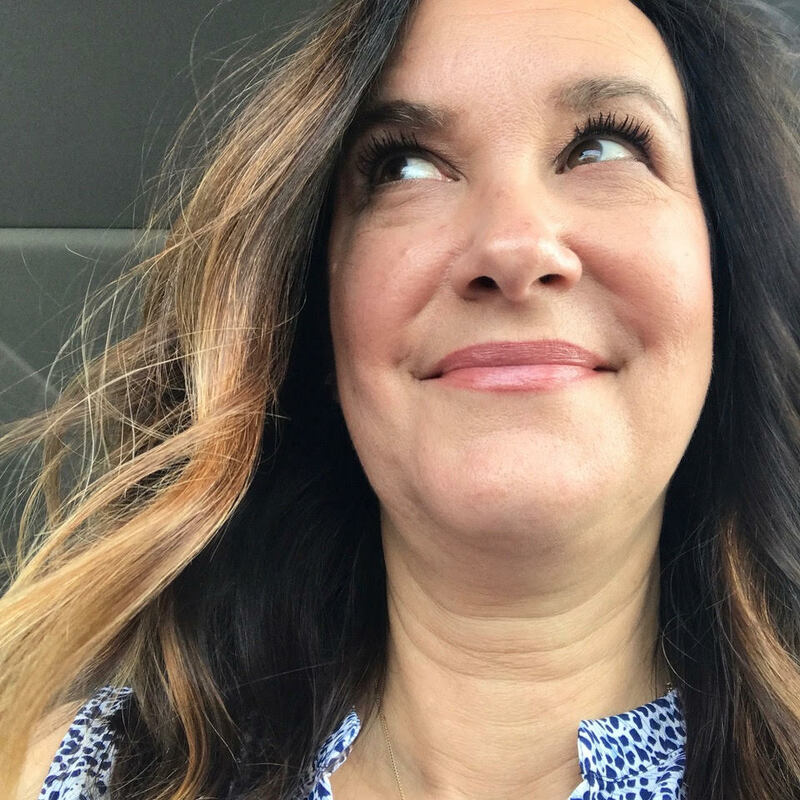 I did want to document my grateful moments, though, and a whole lot of reflection. Some years are tougher than others, so we are certainly looking forward to a calmer 2019! 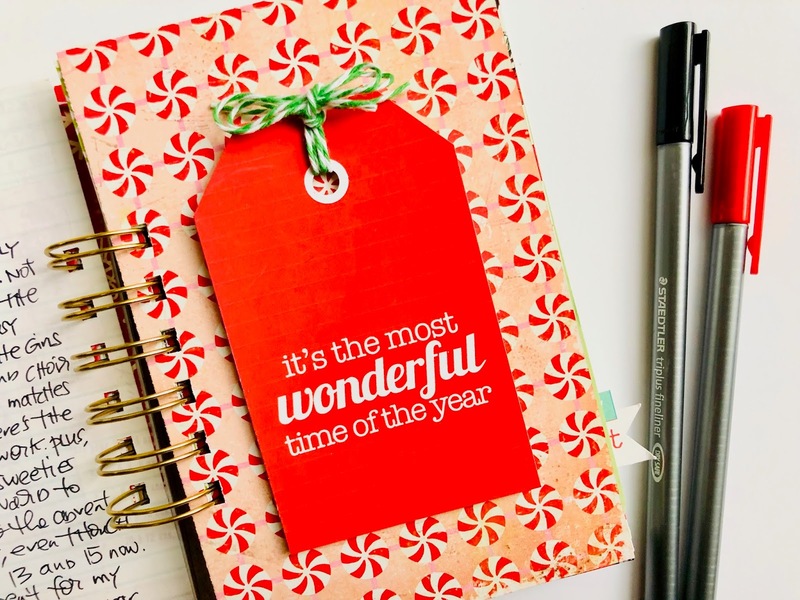 This little CURRENTLY card was in the right place at the right time for me this year. 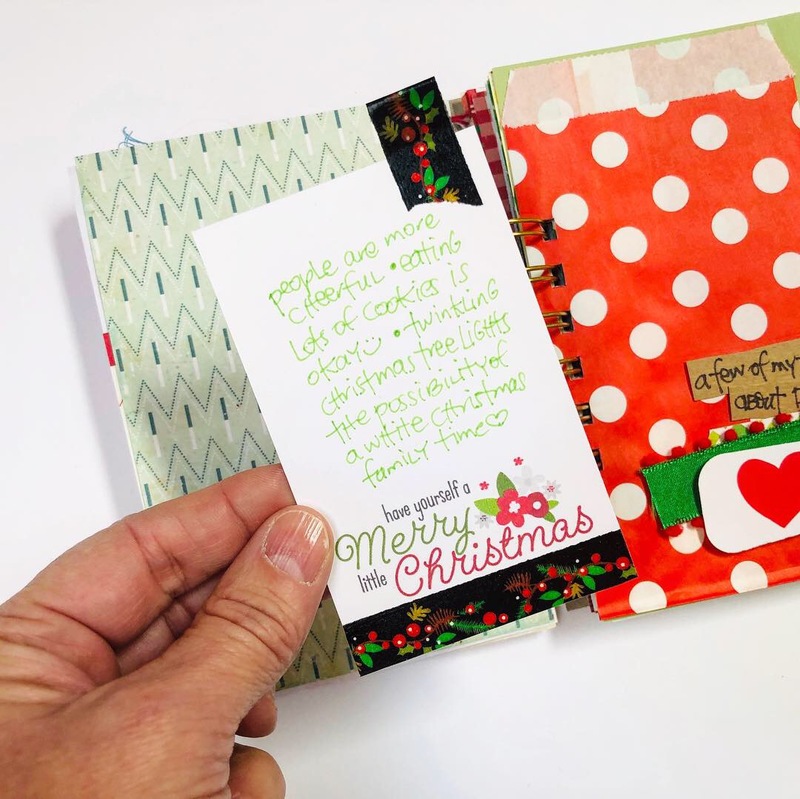 Christmas is a season filled with so many activities and family traditions, this journal card allowed me to be short and sweet, but still filled with thankful thoughts. 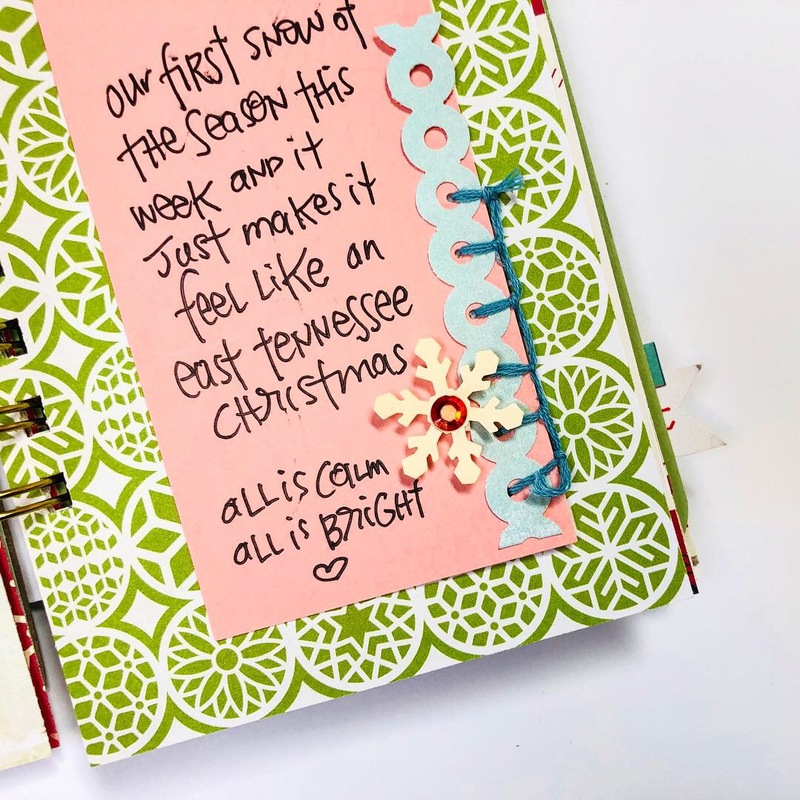 ...and then I used a journaling card this week, find it here, which I added to the other journal cards in my book ring mini journal that I posted here. 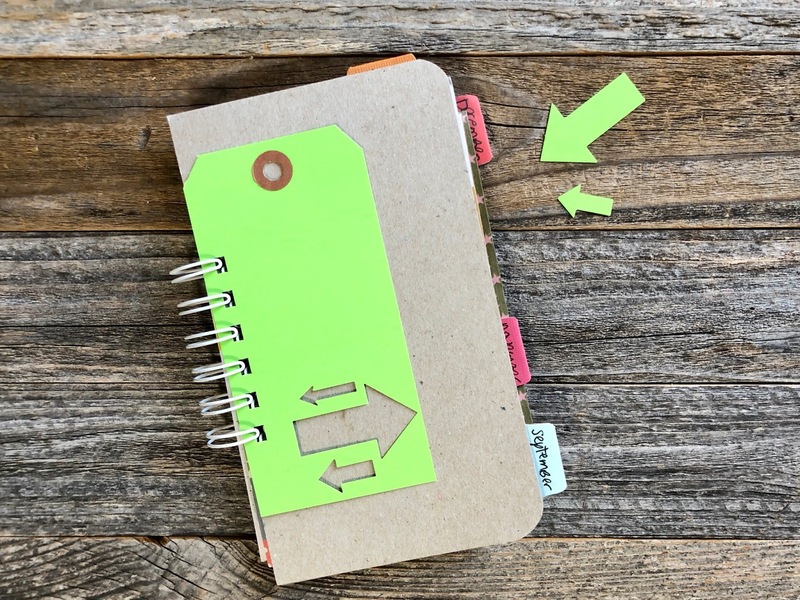 I definitely see me using this journal at least once a week in addition to my most-used mixed paper journal. 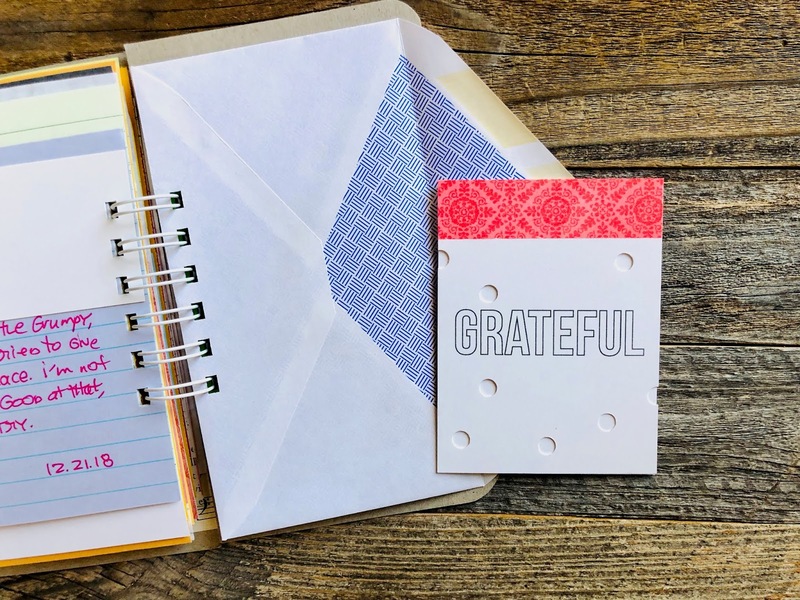 I took a few minutes this week and prepped the last two pages in my 2018 Gratitude Journal. 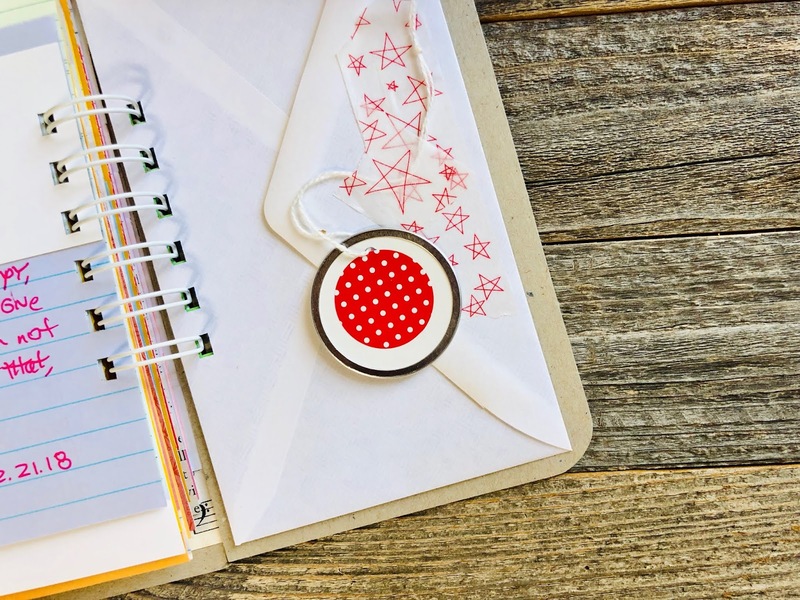 The envelope came unadorned but I decided to add the washi tape and polka dot tag from a gift bag a friend sent me. 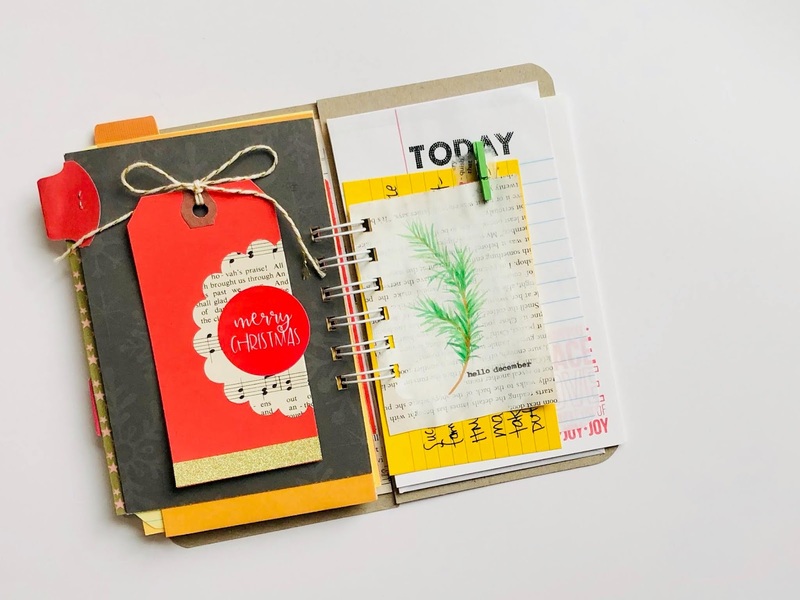 Inside, I tucked two journaling cards which I attached together with washi tape to form a sort of notebook. 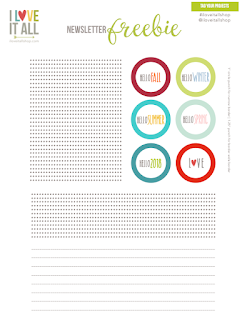 It is now ready for my gratitude journaling. 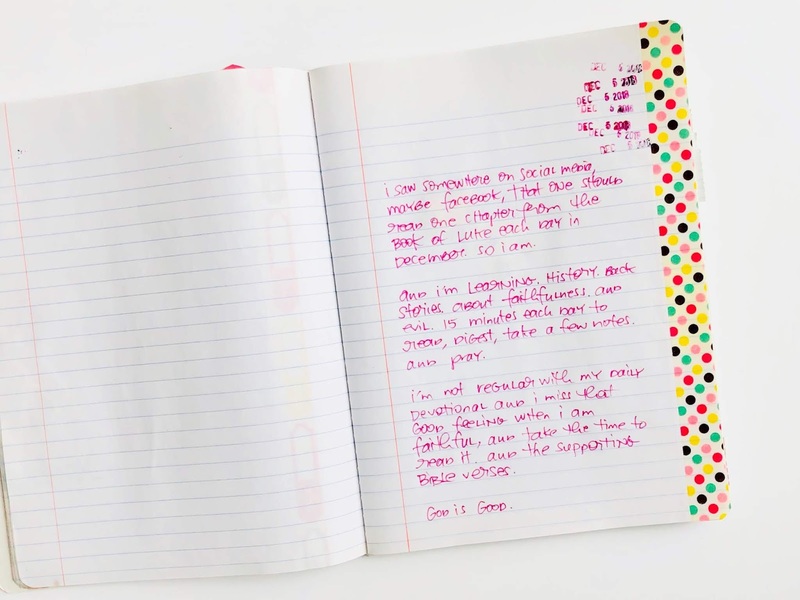 And for the last page in my journal, I pulled out a paper punch. The arrows seemed a good choice, pointing us in new directions as 2018 is ending and 2019 waits to greet us with a new year and new chances. Choosing gratitude will change your life. It will change your outlook. It will change your perception of the past and the joy of the future. 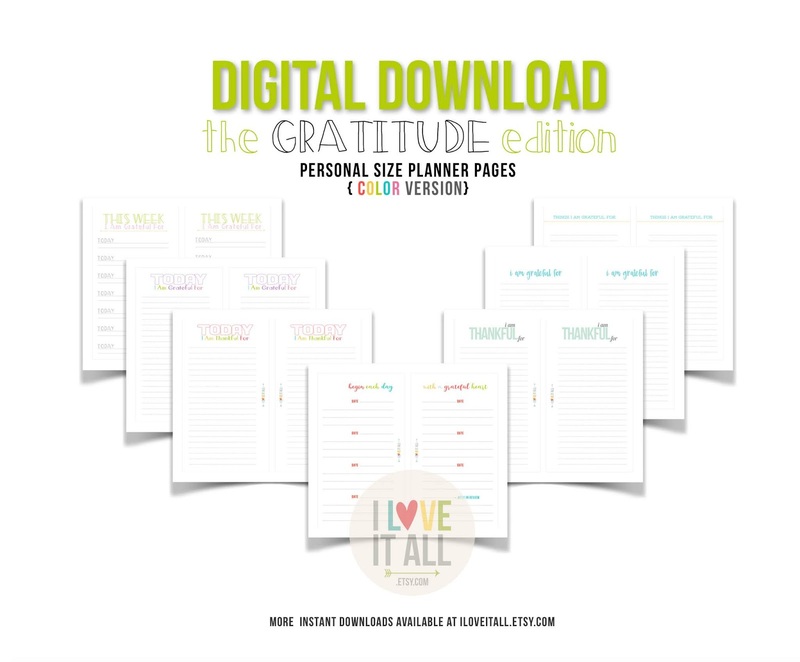 I urge you to embark on a journey of gratitude journaling, your heart will be full. New year, new you, new chances. Phew, can you even believe it's another new year? At this season of my life, days seem to fly by so much faster than I would like. I do make a conscious effort to slow down and enjoy and BE in the moment, not just behind the camera taking photos of the moment. But I'll not kid you, photos are important to me and I do take them because it brings me joy to have them and to look at them again and again. 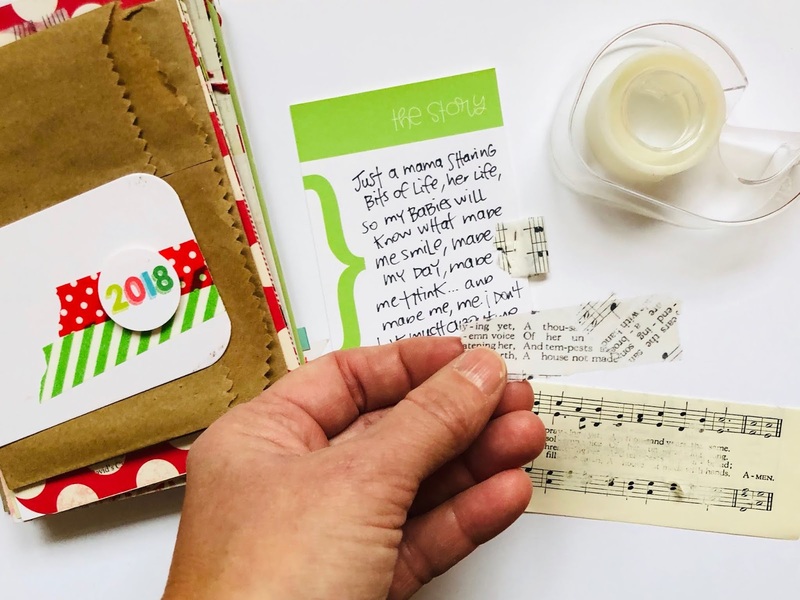 Each month, I'll be sharing a free journaling card with you here on the blog which coordinates with a card set in the shop. I hope that you'll find that it brings a bit of fun to your memory keeping projects. 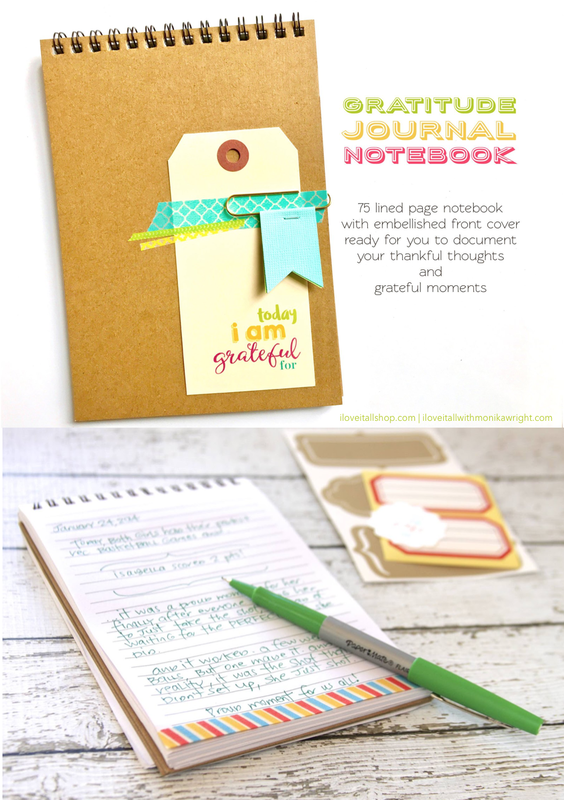 I like to incorporate journal cards into my Gratitude Journal and mini books. Take a few moments and document how you will greet January, how you will approach the next 365 days, how you plan to take this year and make it yours. 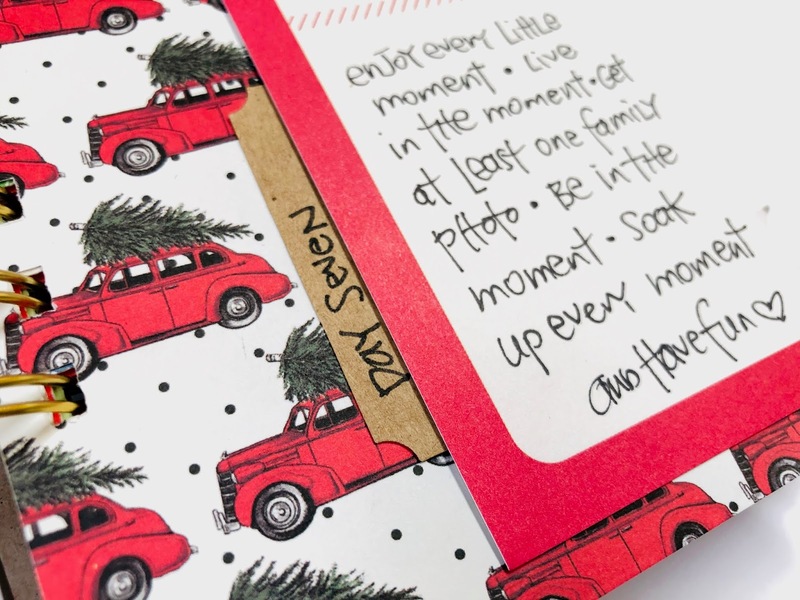 My plan is to document my year by capturing those little moments that make me smile. 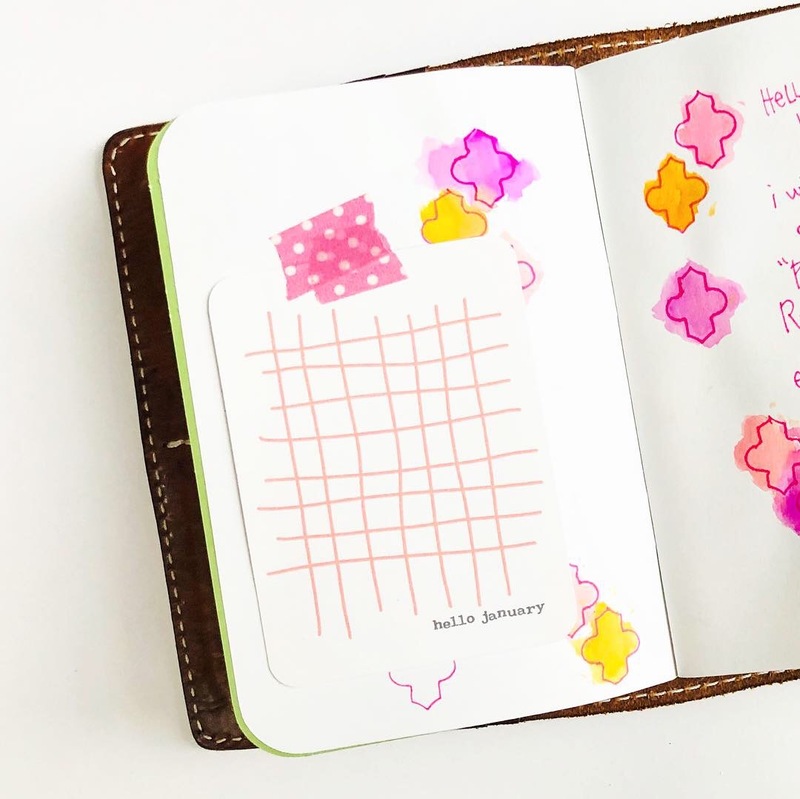 How will you use your journal card? Snow flakes were falling yesterday for just a bit, getting bigger...then smaller, then bigger again before stopping all together. Surprisingly, there was more accumulation in town than here in our little spot in the Smoky Mountains. The journal I'm using sold out, but here are a few more with similar papers and different numbers of pages inside. 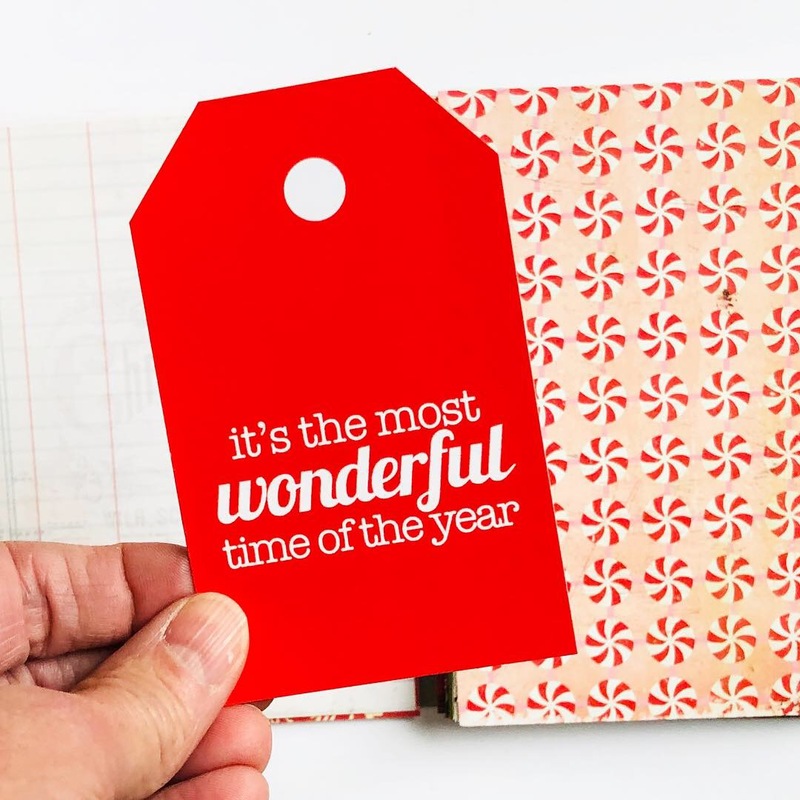 I wanted to showcase that peppermint patterned paper, which I did with the "wonderful" journaling tag, you can find it here, and decided to use the lined page on the left for my list. 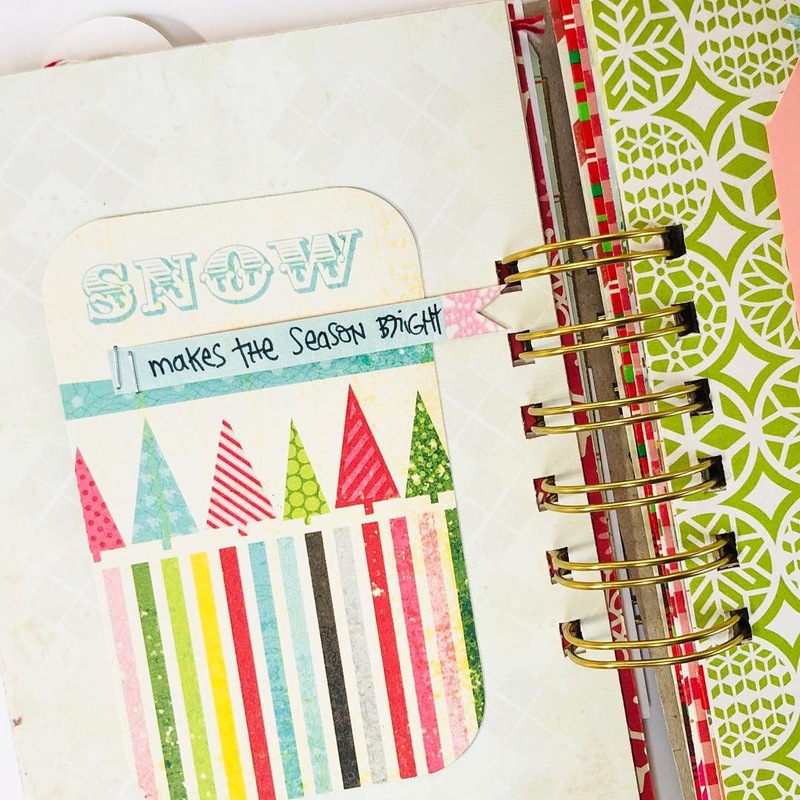 I used the SNOW on the journaling card as a jumping off point for my list. To attach the shipping tag I used a blanket stitch and added a rhinestone embellished snowflake, a negative die cut from this shipping tag. I used two identical die cuts, one for the list prompt and one as a place holder for the date. 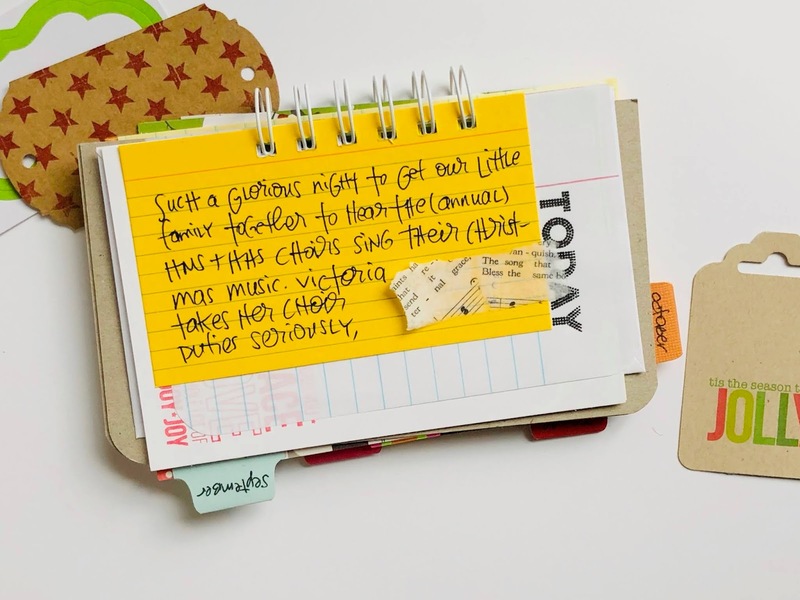 I folded the journaling card and allowed it to spill over to the Day 8 list page. 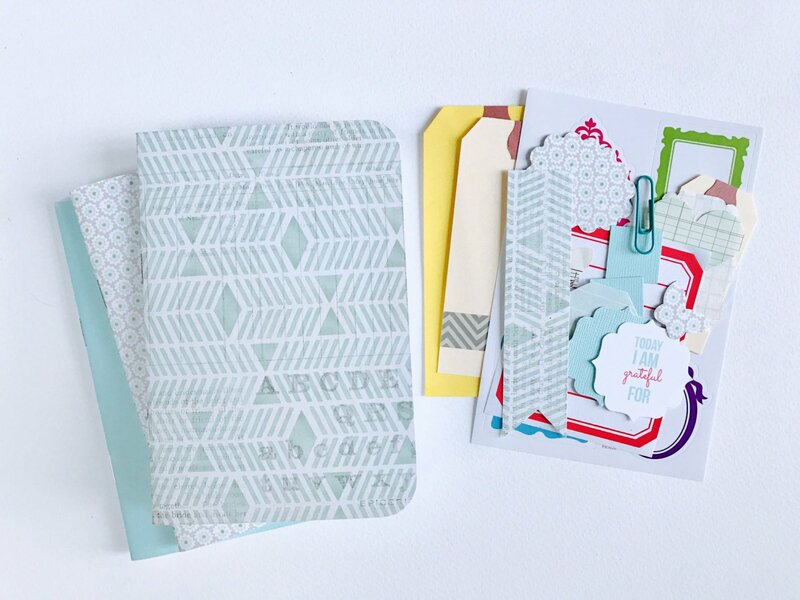 The folded over journaling card from my Day 7 list is perfect date holder spot. 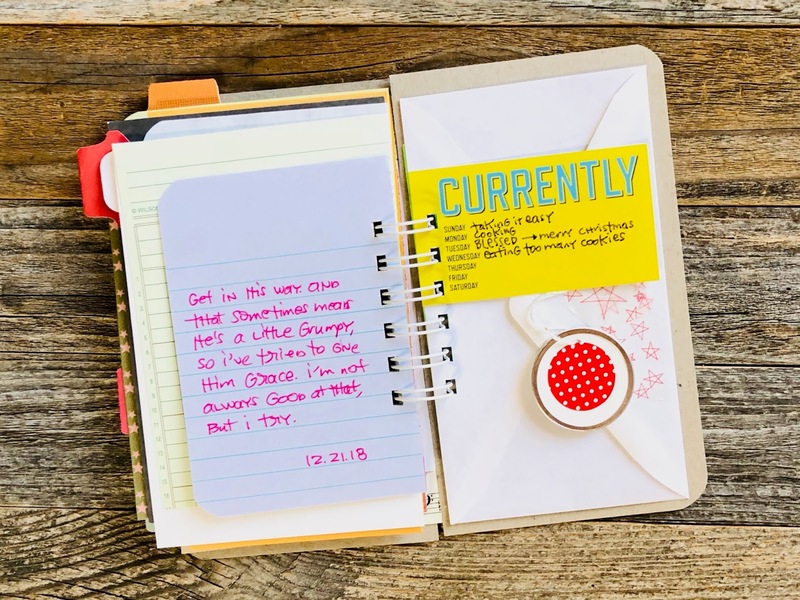 Then, I keep my journaling shop and sweet, yet full of meaning, using a sticker. Any time it feels okay to eat four or five cookies at one sitting, it's a good day! 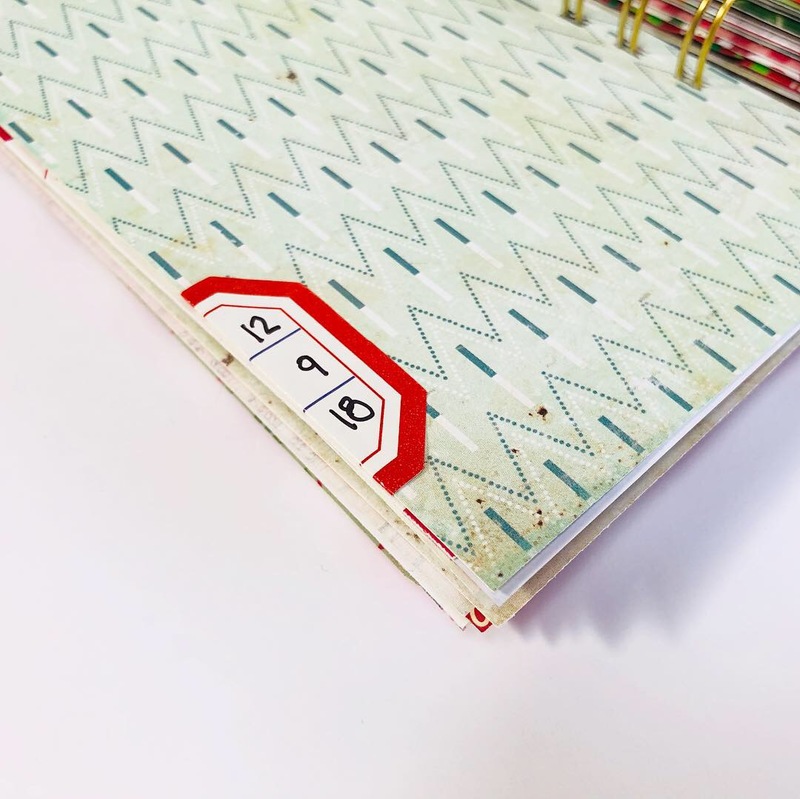 I trimmed down my journaling card a bit to fit inside my polka dot bag, you can find them here, and embellished it with washi tape as a pull tab. 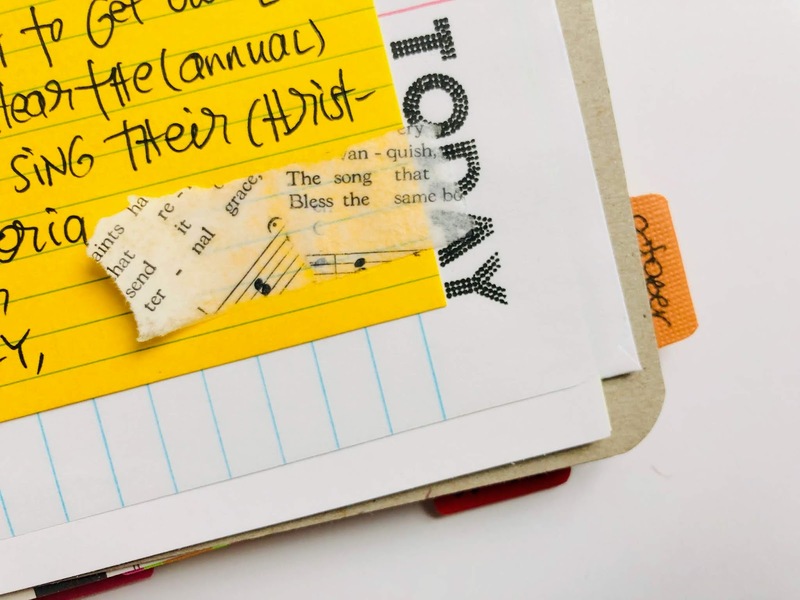 Read all of my 30 Days of Lists posts here. Join the #30lists fun and register here. 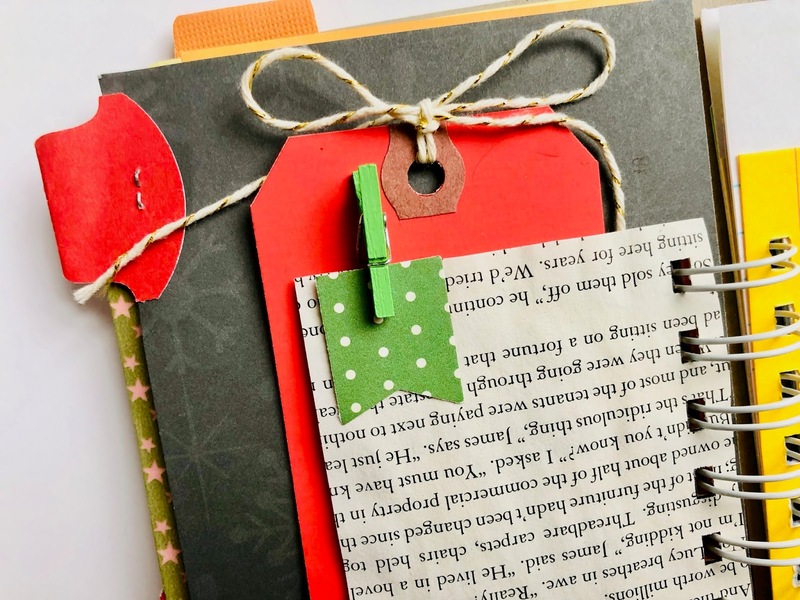 See more journals and mini books here.